As I sit here and think of the fantastic year Vera and I have had as your managers it is hard to realize it is about over. We have made so many great friends and had so many laughts. The Saturday morning donuts and breakfast are something we both enjoyed. Also every holiday there was going to be something happening. To think of the ones that are always there working, cooking or whatever it takes to see that Lakeside continued to have that great attitude. To see the SNOW BIRDS return and the excitement they give in renewing their friendships with those that stay and the others that have the best of the two, summer in the North and winter with us. It has been a fantastic winter with those that we thought would be so much fun and they were. I want you all to know that our leaving has nothing to do with the people of Lakeside, because you all have been great. We are so sorry that Hometown America would not listen to our cry. The first week of the new hours in the office were very hard on Vera and it was very had to watch her cry when she came home on the first Friday night, to tired to want to go on. It appears that we can't get it together, a good company with difficult people or great people with a diffcult company. 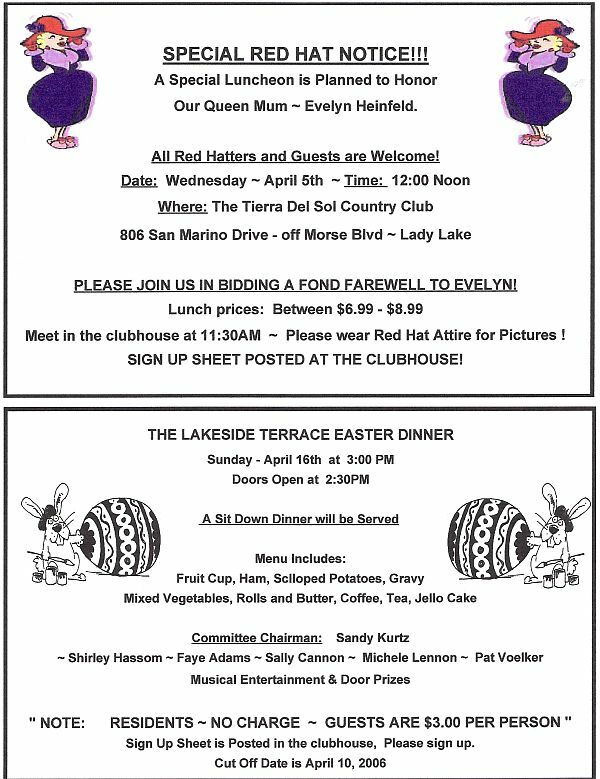 As Vera and I go on we will never forget the experience that we've had at Lakeside Terrace. It's been more fun then any church I have pastored. The good part is, we will be close and will see you from time to time. We close with, we love you and look forward to making new friends and keeping secure those that live in Lakeside Terrace. 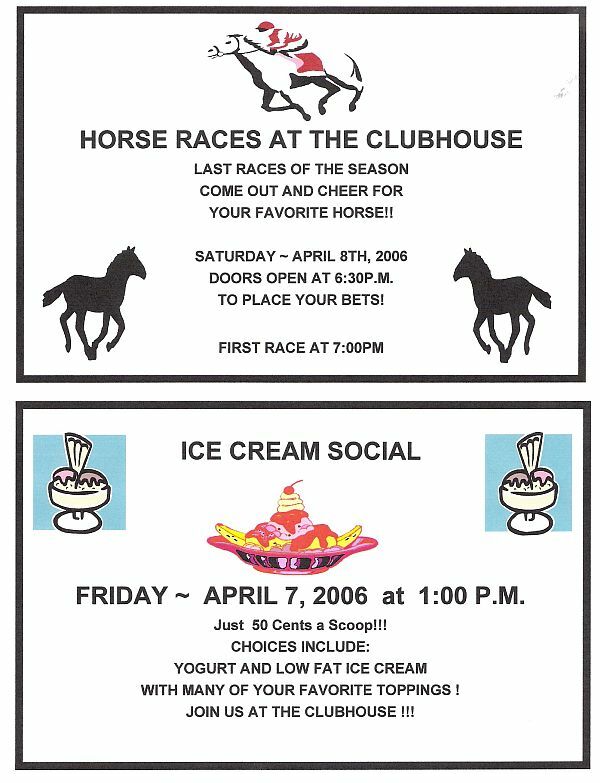 This money is used to buy food and supplies for these parties and the Social Club is reimbursed when funds are received for tickets. 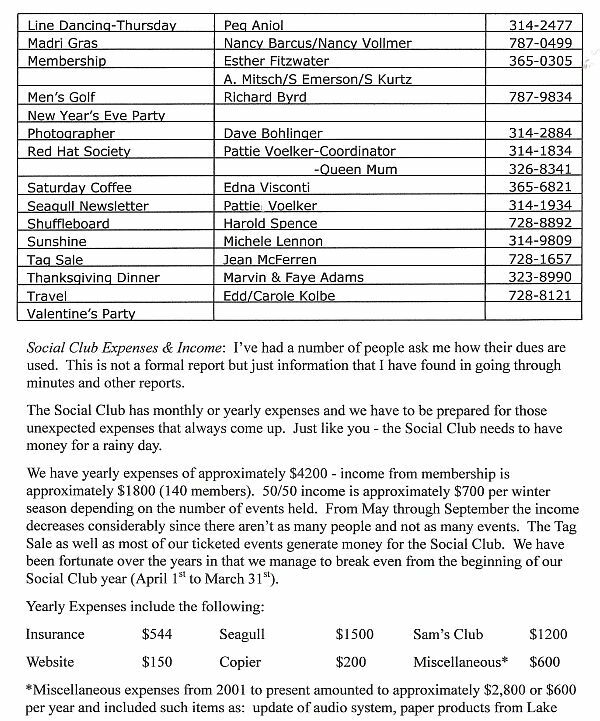 Exceptions to this are the Thanksgiving, Christmas and Easter dinners - Hometown America reimburses the Social Club up to $200 for food purchases. 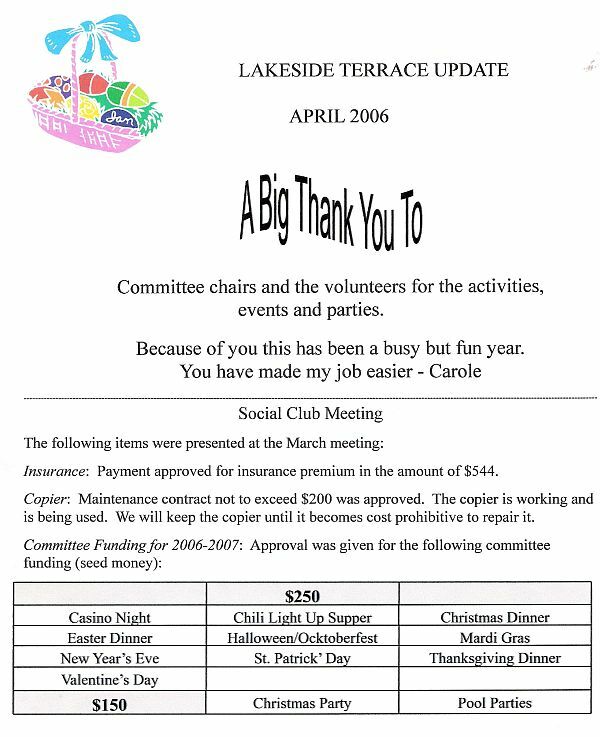 Entertainment for 2006-2007: Approval was given for up to $2000 to be spent on entertainment. Due to the number of people who approached me about this - I felt we should give it a try. I asked Pattie Voelker if she would once again be in charge of entertainment and she has agreed. As soon as she has some idea of what is available she will make the necessary arrangements. The information will be in an upcoming Seagull. Cancellation of Meetings: Approval was given to cancel the Social Club meetings from May through September due to the lack of a quorum. Election of Officers: All officers were unopposed so the secretary to cast a unanimous ballot for President - Carole Kolbe, Vice President - Jan Bohlinger, Treaurer - Judy Laqualia, Secretary - Jean McFerren. Thank you for you support and encouragement. We will do our best to have a smooth running year. Fire Safety Program: The consensus of the members present was to hold off on having any presentation until January 2007. 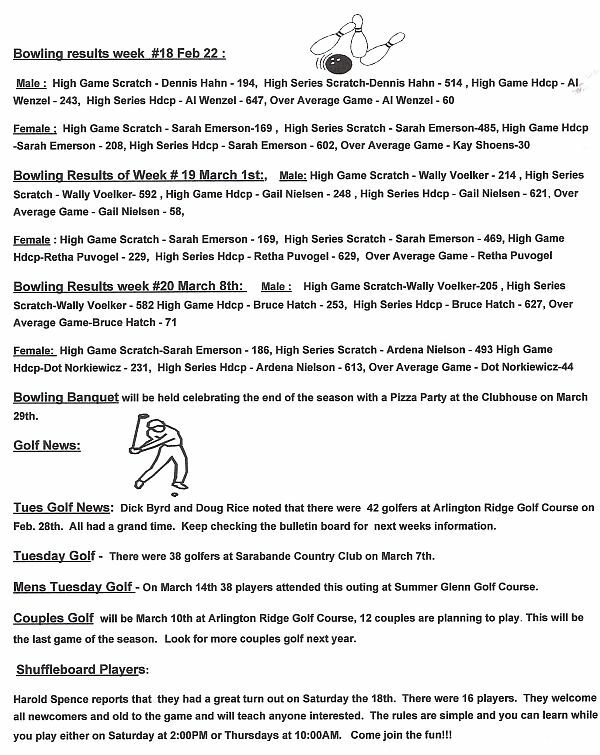 Travel: Information is posted on the bulletin board. March wasn't as busy of a travel month as February but we still found things to do: Twenty-eight of us traveled to Orlando by bus for Menopause - The Musical. Eleven people went to Tampa's Hard Rock Casino. 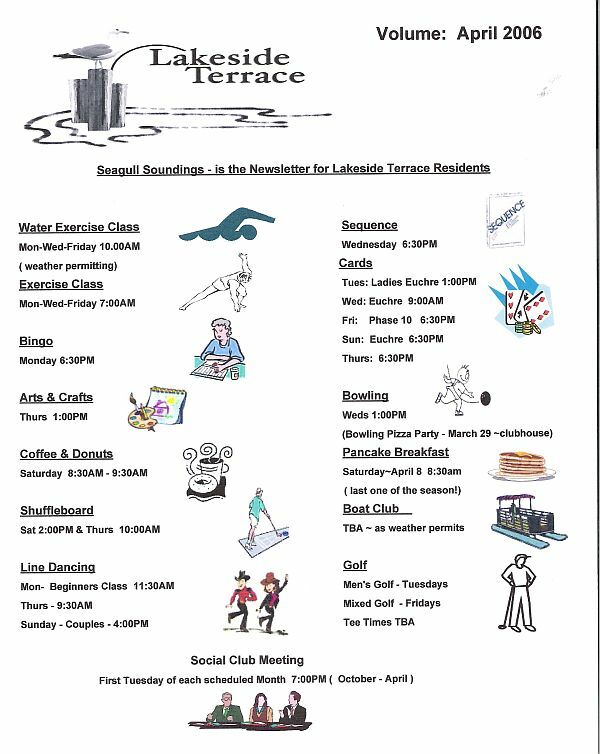 As additional information is received from Landseair, I will post the info on the bulletin board and include it in the Seagull. Landseair provides regular cruises to exotic places, day gambling cruises, multi-day tours and day tours. Committee Coordinators: Below is a list of Committee Coordinators for the upcoming year. 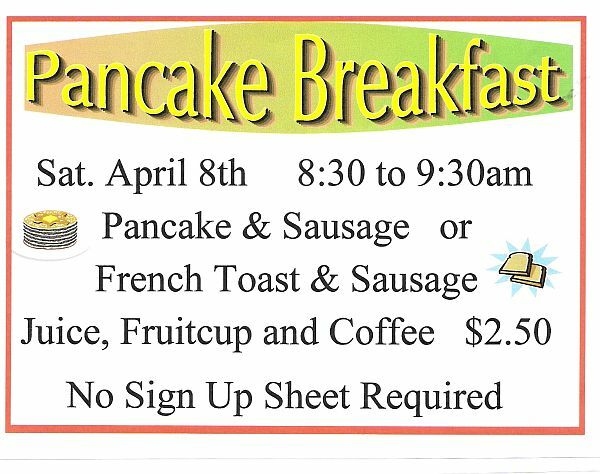 If you are unable to serve, please contact me. 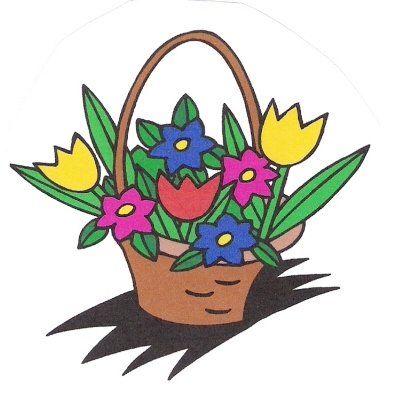 We do have openings for the following committees: Bible Study, Christmas Trim (Decorating), Crime Watch, Easter (2007), Halloween/Ocktoberfest, Ladies Luncheon, New Year's Eve and Valentine's. 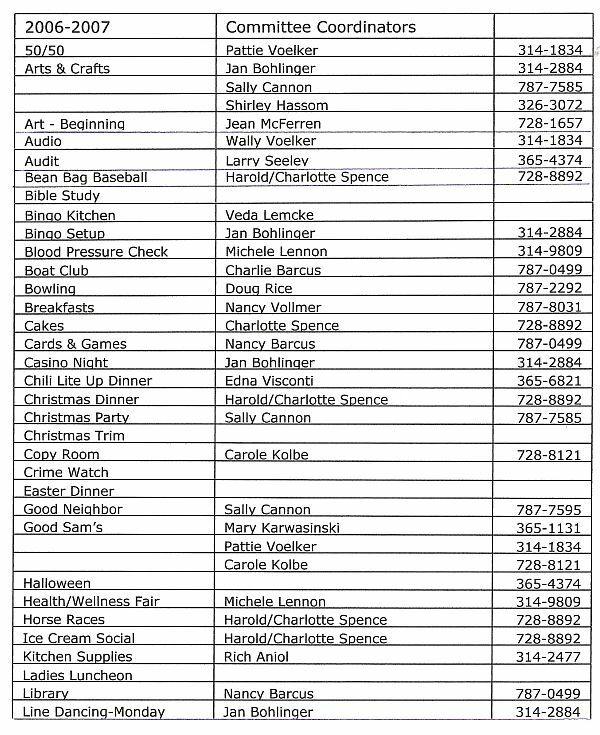 If you would like to chair or co-chair one of these activities or if you would like to coordinate a new activity to replace one of these, please contact me at 728-8121 or via e-mail at cakolbe@yahoo.com. 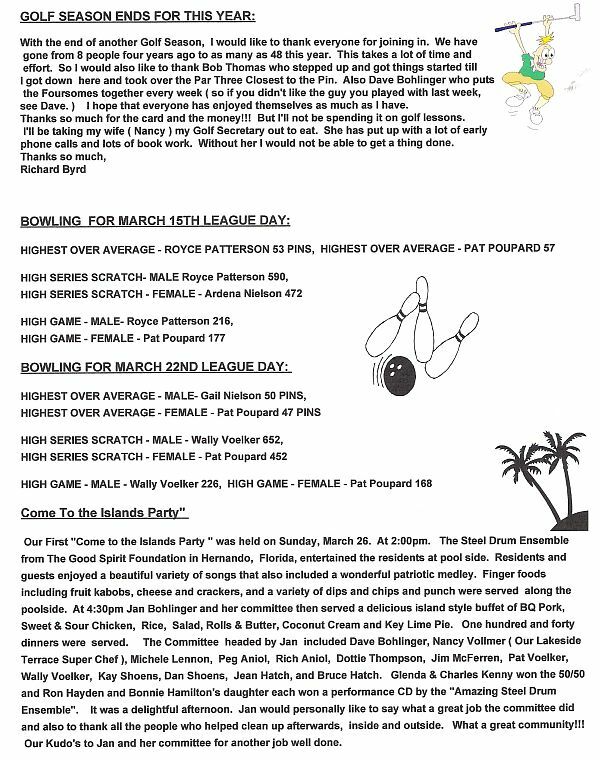 County Paper, ping pong table, pool supplies, kitchen equipment and utensils, organ repair, playing cards, greeting cards, pool cue sticks, etc. In addition to 2 stoves and 2 refrigerators we own roasters, crockpots, pots and pans - it might be years before we need to replace these items but we have to be prepared to do so. Eventually we will need to replace the bingo machine - it is old and we are having problems getting parts for it. Thankfully Loren Foote keeps it operational......at times he has worked miracles. Replacement would cost us approximately $4,000 to $5,000. I am in the process of exploring funding options. 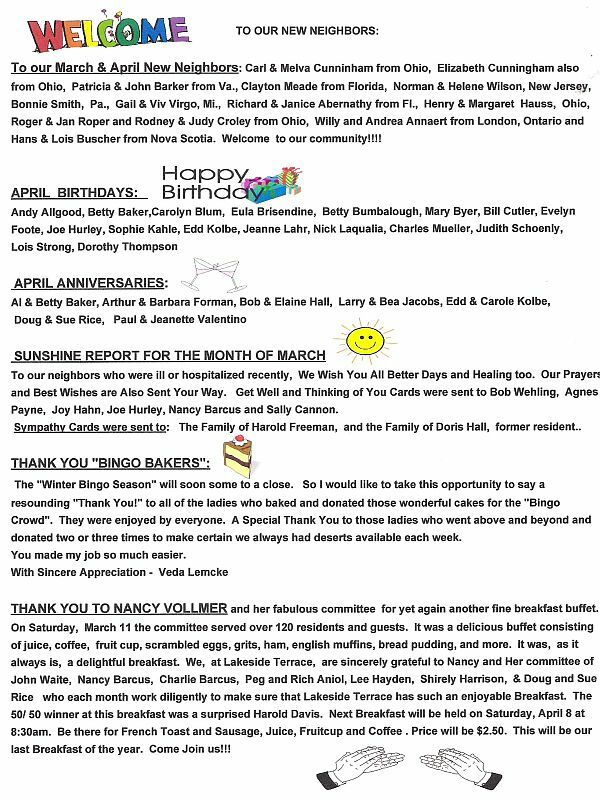 Bingo is one of our more popular weekly activities and is well attended (averaging 40 people each Monday from October to April). Questions, Comments, Suggestions: I would like to ask you to please contact the Board if you have a question, concern, or suggestion. This would alleviate some rumors that get started. www.lakesideterrace.net I'm also reachable by e-mail cakolbe@yahoo.com. This meeting was the last scheduled for the 2006 season. The next will be held in October 2006. Topics touched on were the Medicare Part D program. A reminder was given to people who need to sign up for the program. They must do so by April 1, 2006, or there will be penalties, incurred. There were several plans noted by a representative from Gerber and Associates, a long standing Insurance Organization, in Naples, Florida. Two were, the PacifiCare Program as well as Humana. The Mobile Home Prospectus and Rental Agreement has been discussed at several meetings. This, just as the Title, should be passed on to new home buyers. It not only describes the Lease Agreement but also the Rules and Regulations, set forth, according to and governed by Chapter 723, Florida Statutes ( Florida Mobile Home Act). 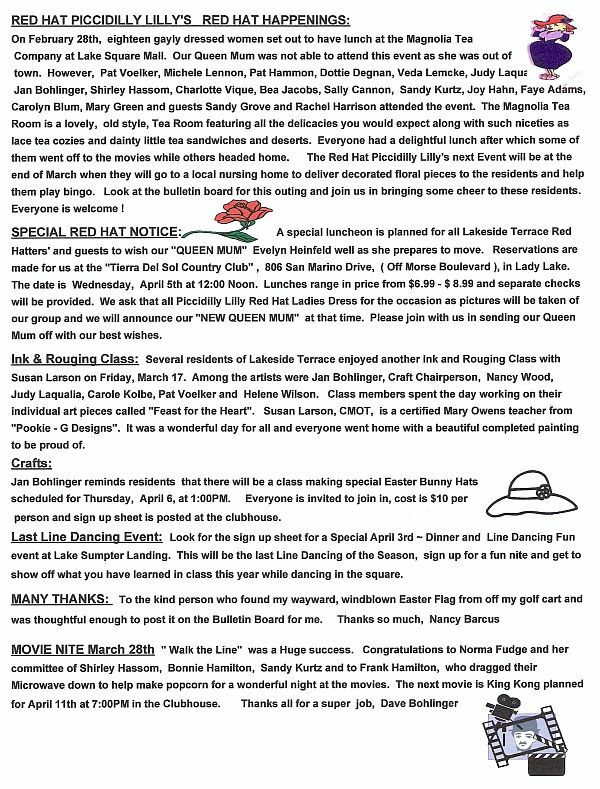 All Lakeside Terrace Mobile Home Owners should have a copy. The last page, Rule XIV, Rule 11 Statement, states that the prospectus was deemed by the Division of Florida Land Sales, Condominiums and Mobile Homes, to be adequate, to meet the requirements of Chapter 23 , Florida Statutes. There wiD be an identification number assigned by the Division. The usually starts with several letters followed by many numbers, such as PRMZOOO593-P30712. The date it was deemed adequate will be on the bottom. majority vote. I would like to thank the By-Law Committee for doing an excellent job. pass out the Proxy Votes to our residents. Thank you everyone for your support. Many thanks to our hard-working committee for making the Health and Wellness Fair a success. A big thumbs up to Wally Voelker, Rich Aniol and Frank Hamilton, who were ready, willing and able to assist with Set-Up, Take-Down and for their help to the vendors, throughout the day. Our grateful appreciation to Joann Hurley, Peg Aniol and Ann O'Brien for manning the sign in desk and starting the day off, with a smile, for everyone who came in the door. And, for making sure they had an opportunity to get tickets for the 12 Door Prizes given during the fair. We couldn't have done it without Carole Kolbe, making sure the coffee and drinks were ready, as well as Jan Bohlinger, who kept the punch bowl filled and the snacks available, on a minutes notice. Peg Aniol, Ann O'Brien, Carole Kolbe, Jan Bohlinger and Judy LaQualia. We had great, positive feedback from the vendors and offers from some to bring other People to do screenings as well. 22 Vendors, over 50 blood pressures were done by LRMC staff, 30 Massages given by Harmony Massage and Wellness and continuous Spinal Screenings provided by the Buchanan Health Group. Ear Visualization with a Fiber Optic Otoscope gave a close up view of what the ear canal and drum looked like and if there was any blockage, by Dr. Robert Bitters of Advanced Hearing and Audiology. Many Thanks to our committee for all their help and to our residents for their support of the Lakeside Terrace Health and Wellness Fair. Five years ago when I finished my cancer treatments I wrote all of you a letter and it was inserted in the Seagull. I never thought I would be doing it again. 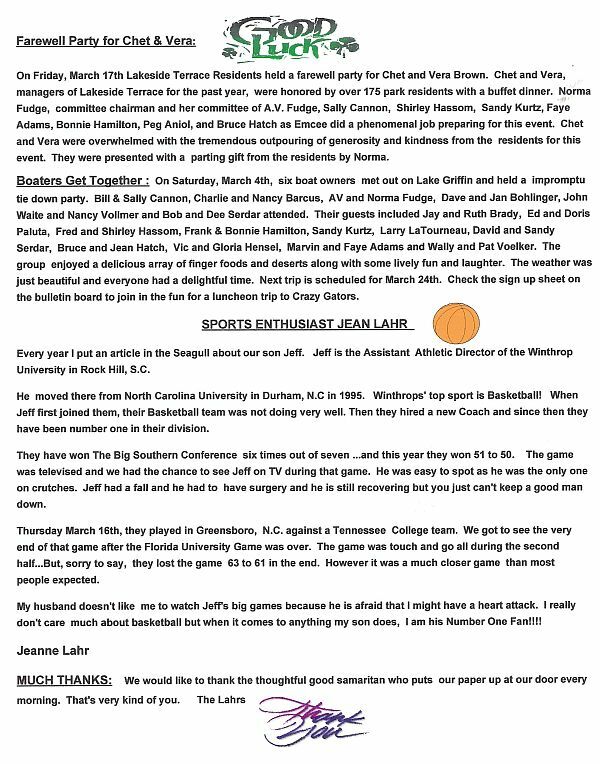 How do I say Thank You to all of you for your graciousness and total unselfish caring that you have shown me this time again during my battle again with cancer, with this letter I will try to thank all of you. When I was a little girl of 4 or 5 or 6, I wished to be a princess when I grew up. Well, all of you have made this little girls dream come true in making me feel like a princess. As we all know, a princess has her court, and I would like to share my court with you now. My King and Queen, Mary and George Douglas once again have taken the place of my Mom and Dad, no way can I tell you what all they have done for me. I won't list the things but surely you can tell by this no princess has ever had a better King and Queen. My Lady in Waiting, Faye Adams, boosting me up on the rough days, by my side with every test and appointment, sleeping on my couch one night when I needed her, none better in my court. Now we get to my cooks, my Italian Chef, Terry Colla, day after day a new surprise that found me licking my chops. And then Nancy Smith's boxes of candy and treats, Nora's ham salad and pasta salads, Nancy Vollmer sending mounds of dishes left over from functions that I wished I could have attended. And now let me share with all of you the VISITS, every day sometimes more than once a day you came in the door sometimes to just say How ya doing Ruthie, and not staying long cause it is a bad day, the good days staying longer and keeping me filled in on the happenings of my blessed Lakeside Terrace, You just kept coming back day after day after day after day, how did you find the time, how can I ever thank you, I can't. But please know my heart is overflowing with such pride and love for each and everyone of you. You took over and became my family since I have none, you did it with the most unselfish tenderness that this princess can convey. I ran out of room for the cards, some sent 5 and 6 cards each with words of encouragement hand written in the folds of the papers, as I lay in my chair night after night reading each card again and crying with joy and love of such caring and amazement, my heart is full. I do not have the space to list each and everyone of you like Jean McFerren with her healthy baskets of food day after day, and Ann Reeves bouquets of flowers and Chris's visits and gifts, but if your name is not mentioned here you are not forgotten there is just no room to add, you know who you are so please wrap your arms around yourself and squeeze a big hug from me to you, I am deeply touched by all of you and will never forget your moments of complete generosity and love. Most important of all the prayers that you have sent to God for me, I love you all for these, (my cup is truly running over). This princess has no regrets, except if I had it to do over again I would dance more, go on more picnics and run barefoot in the Daisy's. May God hold each and everyone of you in the palm of His hands and may you bask in the joy that you have fulfilled my little girl dream of being a princess.